Confession time. There’s a conveyor belt of books about British cycling and when this came out during the summer it wasn’t a pressing read. Boardman’s enjoyed an impressive career but the story of a track and time trial rider famous for his calculating ways didn’t appeal at first. Surely rival Graeme Obree’s story is the more interesting? Add to this the fact that Boardman comes across as dryer than an indoor velodrome and this wasn’t something to rush into. Was it worth waiting for? The first thing that comes out is Chris Boardman’s voice. He actually wrote the book and this helps, many others use the services of a ghostwriter and it often shows. This feels like Boardman, to read the book is like listening to an audiobook, especially with the sardonic jokes and self-deprecation. A common criticism of sporting autobiographies is their shared pattern, the linear tale of junior talent leading to adult success, glory, possibly a setback and the story of the comeback then the book ends, often on a note of reflection or satisfaction. 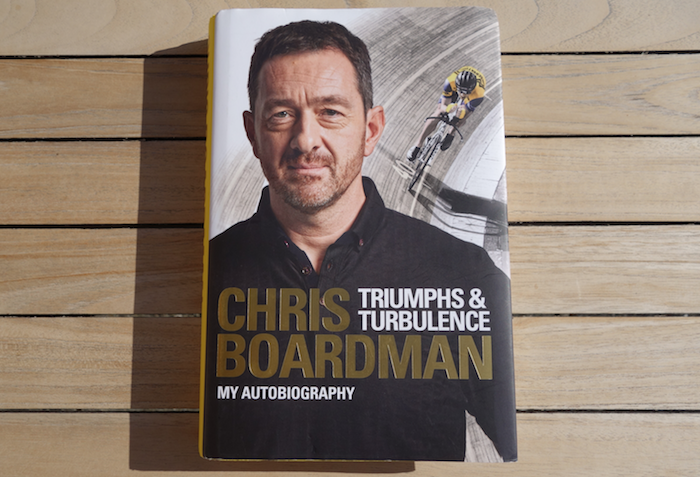 This book has that too but Boardman’s early life, his start in cycling, career on the road, his role in British Cycling’s Olympic success, launching a bike brand and working on television more mean the scope is larger, there’s plenty about his life off the bike and this allows more room for reflection. There are many of insights into all these topics and more. Some are fascinating, for example Boardman’s attack on Merckx’s Hour Record was almost accidental, seven years before the attempt he’d done some track testing and, for heck of it, decided at his coach Peter Keen’s wish, to try some 1970s equipment just to see how hard it would be to match Merckx’s hour. This test stuck in the mind of Boardman’s pro team manager Roger Legeay who suggested a record attempt as Boardman’s road career was coming to an end. This itself leads to a lot of product testing within the newly-created UCI rules and the story of this is interesting; as is the revelation that using a hypoxic chamber – his son’s bedroom with the windows sealed up – was of next to no use; ditto the story behind Boardman’s late surge during the record attempt where going behind Merckx’s pace and then coming back was part of a plan rather than a dramatic moment. It wasn’t that the GAN riders and staff were lazy and complacent: they just didn’t know what they didn’t know. In most cases they’d spent the whole of their professional lives in the closed world of professional cycling, where the past was the template for the future and the best way to do things was they way they’d always been done. This is part of a pattern where Boardman learns more from defeat than victory. Graeme Obree’s rivalry forces Boardman to up his game and other defeats lead to debriefing sessions and lessons are learned and new plans are made. The criteria for spending lottery funds were very strict; they couldn’t be used to simply improve performance, increase participation or even to win world titles, they could only be used to improve the chances of winning Olympic gold medals. One aspect the book doesn’t explore too far is Boardman’s inheritance. A lot of the time Boardman portrays himself as someone interested in learning more and surrounding himself with either clever or curious people as the story of his success but if he’d not been born into a cycling family would he have got as far or rather would he have even started? If he’d not inherited the right DNA giving him a high performance aerobic engine would he have been able to attract and retain the people he meets along the way? If British Cycling hadn’t got so much money he’d not have had a job developing products and if all of this had not worked then cycling would not be booming in Britain and his bike brand and media career may never have started. But it did start and rather than thinking about the counter-factual you could write a convincing case that Boardman was the central figure in all of this, his gold medal in the 4,000m pursuit in the Barcelona Olympics started a ball rolling that led to lottery funding, Olympic glory, Team Sky and much more. Boardman now hopes that it’ll get people cycling, not into racing or a sportive but simply as means of transport, his new challenge. The Verdict: it’s a good read but at £20 for the hardback is a lot of money for a sports autobiography although it can be found online for a lot less. It’s of use to those wanting to study the rise of British cycling as Boardman has been there since the start and been a part of it all and it’s bound to appeal to new cycling fans who know Boardman from British TV but don’t know much about GAN, Obree or Lotus mean. It’s enhanced by the authentic voice and the sweep of Boardman’s career means the book is about a lot more than racing. And yes, it turned out to be a lot more interesting than first imagined. Note: a copy of this book was sent free for review. It is published by Ebury Press/Penguin and available in hardback and an Amazon Kindle version. I also enjoyed it despite expectations – although I do enjoy Boardmans dry humour on TV. They make a good team – not dissimilar in outlook, wry and dry. And, yes, the Imlach book is all you’d expect and more from watching him on TV. An absolute gem. Another thumbs up for Imlach’s book – it’s a lovely read. Inrng, big thanks for this one. It’ll be going on my Xmas pressie list. Forget the Sky fan boy crap that people come out with, if I was a fan boy it would be to this fella that I look to. Back in the 80’s / 90’s we got highlights of TdF and that was about it. This man and Obree helped to change all that. – who suggested (very unkindly, I assume) that ‘The Grocer’ would be appropriate for Boardman! Still, there is something quintessentially and pleasingly British about that anyway. I’m going to twin this book with his (first?) effort from around 1999 / 00 entitled “Chris Boardman’s Complete World of Cycling” which helped teach us cycling novice Brits how to stretch your legs, tighten your brakes, and how to train and eat. It seems fortunate that some kids may have read it and here we are, 16 years later. Arise, Sir Chris. Boardman shows extensively though how open he was to new ideas, not closed-off by the fact that it had been done a certain way for decades and that was the only way to do things. So when we get on to Secret Squirrel club and going down to Southampton Uni windtunnel it all reaps dividends for BC track squad – but the mind games of actually getting those riders to buy-into the results of the research project are intriguing too. Yes, I agree with Inrng : this is not (yet another…) book detailing all the results from a pro career, it’s far more interesting than that : it’s the progression of Boardman’s career through amateur rider – Olympic hopeful – pro rider – Hour record holder – tech consultant to BC – bike manufacturer – TV pundit. And there’s a lot of insight and psychology in here – Boardman could easily have been a senior director of an international company in different circumstances and opportunities. I demand that both Aero Pharoh and The Grocer nicknames are adopted immediately. Fantastic. To look back 24 years ago to a Britain before Boardman’s Olympic Gold medal is almost to go back to another cycling world. You went as a teenager to Halfords for your bike and, on reaching 18, put it away to rust in the garden shed or passed it solemnly down to younger brothers. No one rode to work. No one went out at the weekend on sportives or en famille. I worked at the time in a place that worked with Sustrans, who provided (Euro?) funding for the country-wide development of cycle ways. Several former industrial rail lines were transformed with Sustrans in to lovely cycle routes. Boardman was involved in this, and his success and name helped galvanise Councils and the press to help make the project a success. GAN was previously LeMond’s Z team and LeMond was known to be very progressive in terms of training and technology. I’d be curious to know when the team transitioned from Rock Shox and SRM’s to the team Boardman describes in the quote. Boardman says LeMond is an innovator, one of the few people to make changes in the sport and the team. But you sense LeMond is about to leave the sport too and his ability to shape the team is fading. Interesting point about Lemond. His career was just winding down when Boardman joined GAN. Was it that Lemond pushed the innovation or Roger Legeay? In 1994 at LeTour LeMond seemed to sense his sell-by-date was at hand. I can remember showing up at the GAN hotel for an interview with Greg while Boardman paced around, pretty much ignored by the group of Yanks despite his Yellow Jersey. The squad wanted to go out for a spin on their chrono bikes but LeMond (as usual) was happily chatting away with his fans until it became painfully obvious the GAN management was getting impatient with him. The book mentions Lemond being superinterested in Boardman’s use of a power meter and comparing notes on them. It was pretty clear that it was Lemond and Boardman that were the innovators, rather than Legeay. 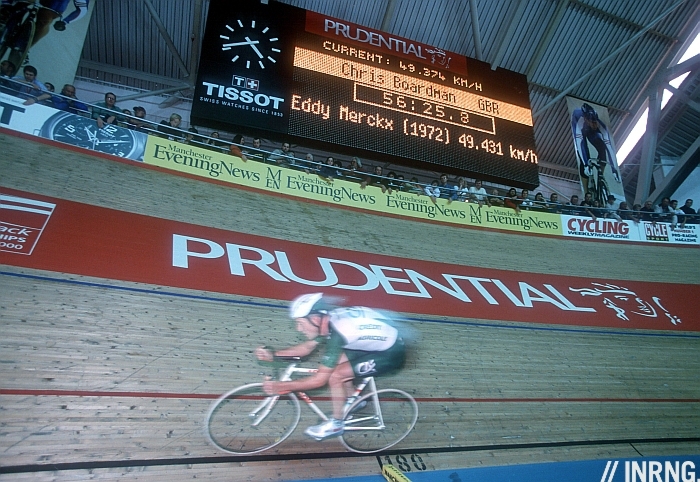 Although, Legeay’s foresight to allow Boardman free reign over his calendar so that he could train and win the big prologues and tts is recognised by Boardman. The contrast between Legeay’s approach with Boardman and Cofidis’s flogging and pressure on David Millar (as detailed in Racing in the Dark) is so stark as to be polar opposite. Hi Inner Ring – long time reader, first time replying. Just wanted to point out a very minor typo – it’s Graeme Obree,not Graham. Cheers for the brilliant blog, ta, Graeme. Fixed, thanks. I would have sworn I typed Graeme but obviously not. For all other readers corrections are always welcome, think of it as a help for the next reader. I found the book enjoyable to read but dissapointing for its content, or lack of. As an amateur racer in England I wanted to read about his experiences of the domestic uk TT scene but there’s next to no talk of his various championships and records, just a bit about his local 10 in Cheshire and a bit on Obree. I was also dissapointed he never spoke about doping. You can’t write a book about your experiences in the pro peloton in the mid to late 90’s and not mention it. Especially as one of the very few clean riders of the time he would have had a different point to put across. Chris Boardman is interviewed in Paul Jones’s book on the National Hill Climb championships. Apparently his memory of the various events he participated in and won is somewhat hazy. One of the most enjoyable books I have ever read on cycling, incidentally! Wonderfully written by Paul. If I recall, the Obree book covers UK TT scene very well, including the 1993 pre-hour record, national ’25’ showdown…worth a read! If you give me a choice between an author who has something to say and writes what he thinks he has to offer, and an author who writes about what he thinks the reading public may want to read – give me the former every time. Whether I like it or not. I was pleasantly surprised by the lack of detail about domestic events mentioned in the book. Let’s face it the UK TT scene isn’t exactly a hotbed of excitement. Just imagine how dull you’d find a review of his amateur racing days by Charly Mottet. Our Eric? You must be local! Lovely place to ride, by the way. Mr Inrng, Have you ever thought of doing bike/product reviews? unfortunately, reviews from many other sites follow a very similar (and lazy) formula of simply repeating the marketing material for the product. It could be part of the exclusive section. Im sure if would be very, very popular. I have but it’s hard to be really independent. For example nobody is buying ad space in return for reviews on here, but it’s still possible that mood and other factors influence things, how do you test a bike which feels fast and then separate the feeling from the measurable things like windspeed, temperature, humidity, air pressure etc and all the rest like tire choice, pressure, chain lube, state of fatigue etc. When you read those “I set a new PB on a climb” reviews you never know if the conditions have changed, how often the writer tests themselves on the climb etc. Not that it can’t be done, just that it’s hard to do anything that different from what’s out there. But there might be a review or two of stuff I’ve been using and want to share. “Its 17% more vertically compliant than last years model and 6% more stifferer than the previous stiff model”. No please don’t do that BS on here please. I guess it is a fine line between being the cycling site with brains or going the full Road CC and reviewing valve caps. It would be good to see some objective reviewing on here, but if you ever refer to handlebars and stem as “cockpit” we’d have to come round your house and shoot you. Yep, leave the “laterally stiff and vertically compliant” product testing nonsense to everyone else. Though it would be interesting to learn what you actually ride and use, for the routes you visit and so on. Chris Boardman AND his coach Peter Keen are the core, the heartbeat, that started the rise of British cycling. Thinking back to that time, there seemed to be an absolute plethora of green / eco projects on the go in the public and private sectors, from recycling to composting to proper cycling! To get Boardman’s name and association was to guarantee press coverage (at least in the NW of England) and I’m sure that the poor fella got bothered by all kinds of mad cap things. But he stuck with it and I think his influence goes way beyond British Cycling. More like cycling in Britain. I’ve just seen a young lad go past on a Boardman racer, riding on a designated cycle route. one of the best autobiographies I’ve read, cycling-related or not. Appears to be honest, often insightful, often humorous, and covers a fascinating career span from successful athlete to founding member of the current British cycling medal factory, and with it the boom in cycling in Britain. I have just finished it. Very dry, very funny. He’s guilty of under selling himself, but then anyone who knows, or thinks they know him, will expect such a self effacing book. It reads like Ned’s books – a really good rhythm in the writing, some read it twice subtle p*ss takes and quite subtle take downs of a few people..
Two packs of 20 Marlboro Gold cost £19.20 I’d say the book is worth it. If you’ve not read it, ‘The Flying Scotsman’ (Obree’s autobiography) is a truly excellent read. It was interesting but a different beast to the Boardman book. IMHO I’d plump for the latter as the less self-absorbed, bigger and better written of the two stories. This is a great book in many ways – superb cycling tales, a real sense of the sheer dedication in the sporting world and a refreshing down to earth focus on what is important in life. Boardman is a true leader and radical and would succeed in any field. It is truly staggering how much he has done with his life. He tries to tell us what is important and how he gets things done and it just comes across as common sense; what he has done would be world news in any other field of sport, politics or business. I agree with the comments above that he and Peter Keen are the real heroes of the British Cycling explosion and history will show that to be the case. I am still trying to find out how I can apply the Boardman technique to my little life. Something along the lines of where am I now, where do I want to be and what do I have to change to get there. Maybe some day. I am sure most people have seen the Boardman documentary The Final Hour – it is on YouTube and covers a lot of the themes in this book. Sincere condolences to Chris and his family on the sad loss of his mum Carol recently, it’s tragic that such a lovely lady and a super advocate for cycling should leave us this way. This is a thoroughly enjoyable read, recommended for cycling fans, disgruntled olympic cyclists and most national coaches alike. I enjoyed Chris’ irreverent ‘Scouse’ humour, yes I know he’s from the Wirral but close enough. The account refreshed memories of many events and how pivotal Peter Keen was in forging a vision for British cycling. It conveys a little of how much back-room work and reappraisal of traditional methods goes on at BC/SKY and how often ‘common-sense’ means just aren’t useful, mind-boggling stuff. Thanks for the belated review INRNG and to Mr. Boardman for a tome that I’ll certainly read again. I was totally unfamiliar with Boardman (I’m a newb and not British) and bought this book based on this review and the comments. Just tore through it in one sitting; am not disappointed. Learned a lot and some of the stuff he writes is legit hilarious, I hadn’t laughed so hard all month. You could make the case for reading a book about Boardman and his era than a number of other more recent British cyclists – success isn’t always the same thing as influence. Btw what happened to Peter Keen? Still coaching or moved on?